Tonight is date night. Studhubs and I don't have traditional date nights these days. I think anyone who cares for someone else can relate to the fact that, whether it's children or an elderly parent, getting away is not always easy. So lately we have been doing a lot of after bed "Stay In" date nights. But just because you're staying in doesn't mean it can't be special. For example, tonight we're going to light up the fire pit, hook up the shop radio, and have a romantic evening under the stars. 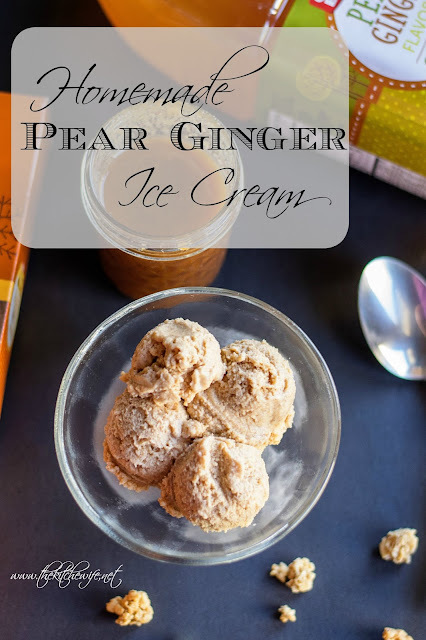 I always try to have a special treat for these kind of evenings so tonight I am making a delicious Homemade Pear Ginger Ice Cream. 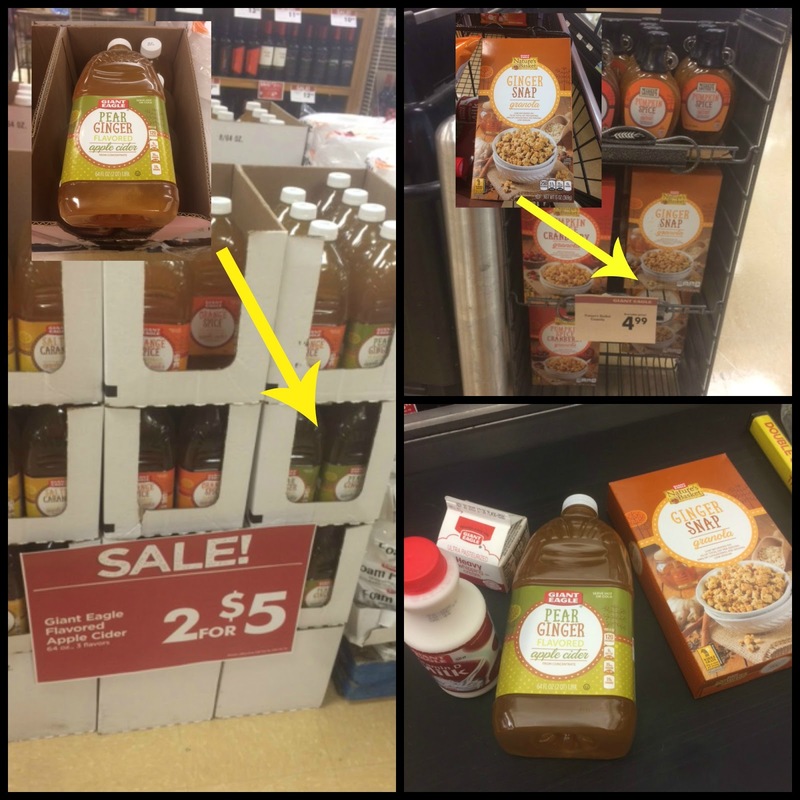 The other day when I was walking through Giant Eagle I noticed they had this new #FlavorsOfFall line of food products. That's one of the things I love about them. They are so great about having items that you just can't find anywhere else. Anyway, as I was perusing through the aisles I saw this Pear Ginger Cider. I immediately thought to myself "that would make a great ice cream". So I scooped it up and put it in my cart. Then I saw the Gingersnap Granola and thought "that would make the perfect topping" so in the cart it went. I picked up a couple more things that I needed and was on my way home to get started! Pear Ginger flavored Apple Cider. Bring is to a boil and let it reduce for about 10 minutes until you have 3 oz. of liquid. 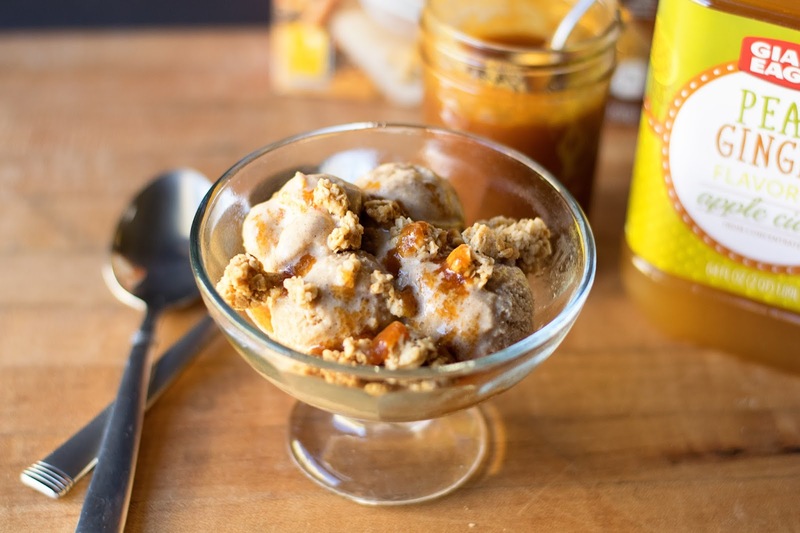 This is now a highly concentrated flavor bomb that is going to drive that greart pear and ginger flavor through the ice cream. Now place the 3 egg yolk into a separate mixing bowl. To separate the yolk from the white I crack the egg into my hand and gently shimmy the white into a separate dish through my fingers. Then I gently place the yolk in the bowl. Now you will want to temper the eggs. Pour a little of the warm milk mixture into the whisked egg yolks and whisk vigorously. You temper the eggs so that you do now get scrambled eggs when you add them to the hot milk and cider. Pour them back into the sauce pot. Place back over medium/high heat and bring to a boil. Whisk until the custard thickens. This take about 7-10 minutes. It is ready when it coats the back of a spoon. Now place a bowl into a larger bowl with ice to create an ice bath. Pour the custard through a sieve into the bowl in the ice bath. The reason you need to pour the custard through a sieve is because inevitably you are going to have tiny bits of egg and no one wants that in their ice cream. Now you will place the custard into the refrigerator until it is cold, about 30-45 minutes. Once the custard is cold you can pout it into your ice cream maker. Pop the lid on and follow the directions to your machine from there. 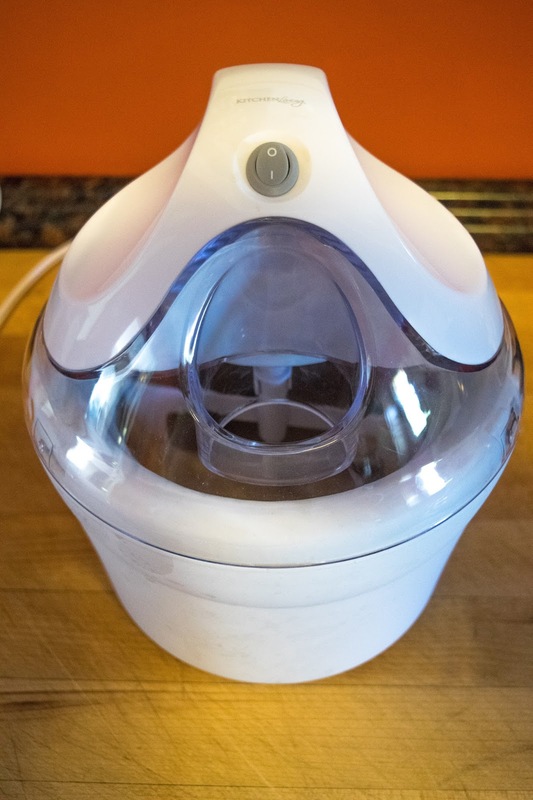 If you do not have an ice cream machine you will simply place the bowl into the freezer and whisk every 30 minutes until is is frozen, but soft. Now all you have to do is scoop into your ice cream dish, top with some of the #FlavorsOf Fall Ginger Snap Granola and drizzle with some caramel sauce and this Homemade Pear Ginger Ice Cream is the perfect Stay In Date Night Dessert treat! I know Studhubs is going to love. The spiciness of the ginger is warm and comforting. When you combine that with the sweetness of the pear and the creaminess of the ice cream it is a win/win situation. So if you are looking for a special treat for date night, and fall party, or something decedent for yourself head on over to your local Giant Eagle and give this Homemade Pear Ginger Ica Cream a try tonight! Place a 3 qt. sauce pot over medium/high heat and add the sugar and cider. Return to pot and whisk in the whole milk and heavy whipping cream. Place the 3 egg yolks into a separate bowl and whisk in a little of the warm milk mixture to temper the eggs. While whisking the milk, pour the eggs in. Place a mixing bowl into an ice bath and place a sieve over the bowl. Pour the custard mixture through the sieve, into the bowl. *If you do not have an ice cream maker place the bowl into the freezer and whisk every 30 minutes until frozen and soft. We don't have a Giant Eagle, but I NEED ginger snap granola. NEED.